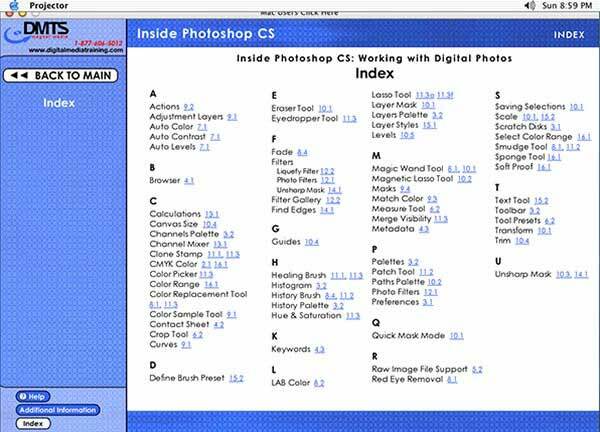 Inside Adobe Photoshop CS: Working with Digital Photos is an interactive training DVD that is a tremendous resource at a tremendous bargain. 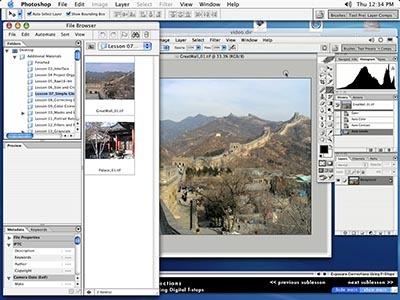 The program is a step-by-step visual manual to the digital darkroom that is Photoshop. 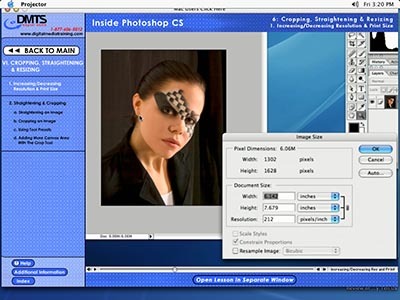 It is designed both for beginners who need to start working in the world of digital images, as well as for professionals who want more in-depth techniques for retouching and printing photos. This review is coming from the perspective of a Final Cut Pro editor. 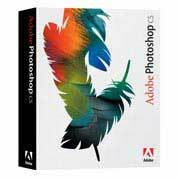 Adobe Photoshop has been essential for working with graphics and photos to import into video projects. If, like me, you have been using Photoshop primarily for formatting stills for use in Final Cut Pro, and perhaps creating title cards, but have never gone much deeper into this gargantuan program, now, with this powerful new update to PS7, is the time to invest in a little training. The concepts applied to still photos are directly relevant to video as well. The Disk contains all the project files that you will need in order to follow along with the lessons. You simply copy the 'Additional Materials' folder to your hard drive. You even have a 'Work in Progress' folder already prepared for you to save to. Each lesson includes a variety of professional photos to work on. You are warned that you MUST have Photoshop CS installed to use the project files, but I found that version 7.0.1 worked fine. Some of the enhancements; to the File Browser, say, or the Healing Brush were not available, but I could easily extrapolate the info I needed. Part way through the training, I did download Adobe's 30 day full tryout demo of Photoshop CS. Given the new accommodations to work for export to video, it is well worth the price ($169) to upgrade. 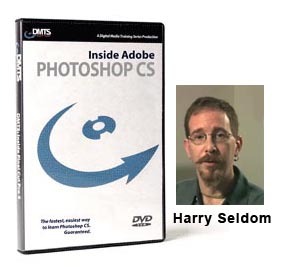 The Instructor is Harry Seldom, who, according to his bio, is an artist who has been working in digital graphics for 18 years. For the past several years he has been using FCP and producing digitally modified photography with Photoshop. I was immediately pleased to see that he had FCP experience, and the disk includes info relating to video throughout, including a chapter on "Video Output"
The Program covers everything you need to know about images in the digital realm. The training is in-depth, and very well organized. As the expansive table of contents shows, the more than 7 hours of material is broken down into 2 to 8 minute mini lessons. If you need to refer to a particular subject in a lesson you have previously taken, the Index has clickable links to the relevant lesson. One of the most valuable things about this project-based, interactive training method, and DMTS in particular, is the ability to open the lesson in its own window, separate from the main index, with PS open as well. You can pause the training, and work on the same file Harry is instructing about. He encourages us to play around with the settings and sliders, and gives the technical background for the processes. I always came away from a lesson understanding 'why' it was done a particular way. with the lesson in Photoshop. As a video editor, I thought I would not have much need for training on retouching and printing photos, but I found that the tips and techniques on color correcting, masking, composite modes, etc., are all directly relevant and transferable to FCP or After Effects. And for real-world 'flat art' relevance, all the information about color space and setting up images for output to an ink jet printer allowed me to (finally) get a color-correct copy of a video box insert which includes stills from the video as well as graphics and text. 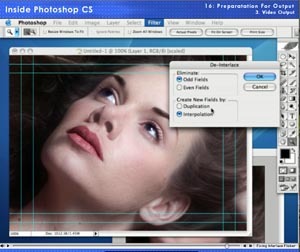 The processes are organized into a workflow that professional digital photo artists would use,. 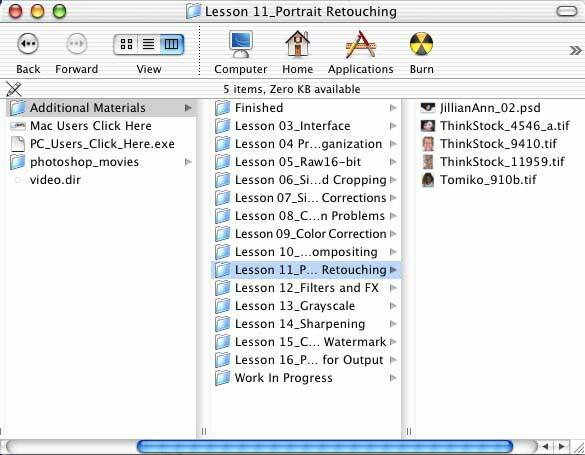 We are advised, for example, that sharpening is the last process in the workflow. Learn to increase resolution without blowing up pixels. I was particularly interested in the extremely valuable technique for increasing resolution, and insight into the new Histogram palette, and the changes that can be effected and monitored there. 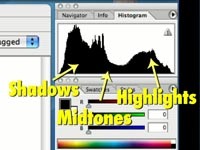 A very precise and detailed explanation of the new Histogram palette. There are insider tips and tricks scattered throughout the training. 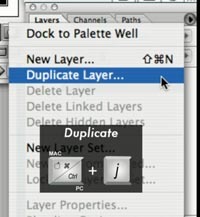 For example, although 'Duplicate Layer' has no keystroke listed in the drop down menu, Harry tells us that it is in fact 'cmd-J', and whenever, in the course of the rest of the training, we need to duplicate a layer, he reminds us with both the verbal, and the visual reminder. 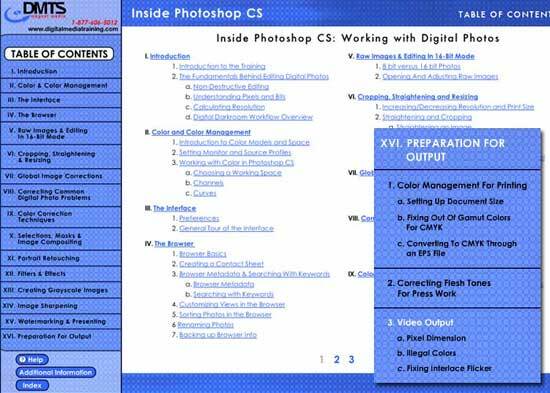 "Inside Photoshop CS: Working with Digital Photos" is a comprehensive and well-designed training program, and the most cost-effective and efficient way I've seen for really getting deeply into the intricacies of Photoshop. I highly recommend it to anyone, at any level of expertise.